Ronnie Dean Coleman (born May 13, 1964) holds the record of eight straight wins as Mr. Olympia, a record career total that he shares with Lee Haney. Alongside his eight Mr. Olympia wins as a professional bodybuilder, Coleman holds the record for most wins as an IFBB professional with 26. He broke the previous record (held by Vince Taylor at 22 wins) in Moscow on November 5, 2004. Ronnie Coleman graduated from Grambling State University (GSU) in 1986 with a BSc in accounting. While attending Grambling State University, Coleman played football as a middle linebacker with the GSU Tigers under coach Eddie Robinson. After graduation, Coleman became a police officer in Arlington, Texas. He served as an officer from 1989 to 2000 and as a reserve officer until 2003. Being a police officer allowed Coleman the free time he needed to work out. Coleman’s fellow officer suggested he attend a gym known as Metroflex. The owner of the gym was Brian Dobson, who happen to also be an amateur bodybuilder, offered Coleman a free lifetime membership to Metroflex if he would allow him to train Coleman for the upcoming Mr. Texas bodybuilding competition that year. 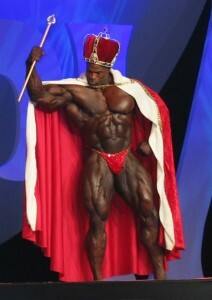 After the training for the upcoming event of Mr. Texas, Coleman won first place in both the heavy weight and overall categories. He also defeated the man that trained him, Dobson. Also in 1990 not only did Coleman take the title of Mr. Texas but he also took titles in that years National Physique Committee (NPC) Texas Championships. 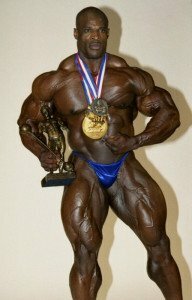 In 1991 Coleman also won what is probably considered one of the most prestigious competitions in amateur bodybuilding, Mr. Universe. This victory qualified him to enter the professional contest sponsored by the IFBB, the sport’s largest sanctioning body. Ronald Dean Coleman was born in Monroe, Louisiana, USA on May 13th 1964. Nicknamed “Big Ron” he is well known for his eight-time Mr. Olympia title, winning the contest consecutively from 1998 to 2005. He also holds the record for the most wins as a professional IFBB Bodybuilder. In his younger years he attended Grambling State University in Louisiana and graduated with a degree in accounting. During his time at the Grambling State University he also played as a middle linebacker for the school’s football team the GSU Tigers coached by the well known Eddie Robinson. After his graduation Coleman became a Police officer. One of his fellow officers recommended him to join the local gym known as Metroflex. Brian Dobson was the gym owner and offered Coleman a free lifetime membership if he allowed him to train him up for the upcoming contest Mr. Texas. Coleman went on to win the Mr. Texas title along with several other wins including NPC Texas Championships and in 1991 he took the Mr. Universe title which qualified him to enter professional contest’s sponsored by the IFBB. Coleman won his first profesional competition in 1995 at The Canada Pro Cup. The following year he won the contest again. Followed by a another first place win in 1997 for The Russian Grand Prix. 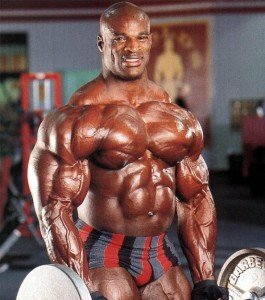 Coleman went on to win many professional titles including eight straight Mr. Olympia titles. Coleman’s approach to both his diet for training and his workout routine is ordered and logical based upon first “what he has been taught” then modified to work for “what really works”. 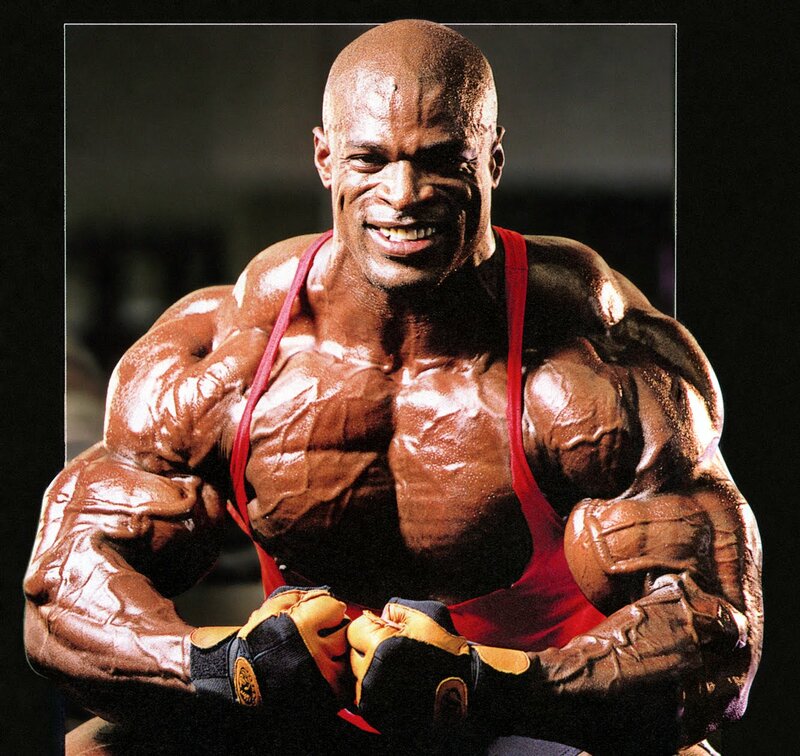 Good muscle genetics alone cannot account for an athlete like Ronnie Coleman’s successes. His routines are adjusted to keep him in shape, increase his density and definition and that iron will keeps it all on track. In addition to his competition successes Ronnie Coleman recently launched his own product line called Ronnie Coleman Signature Series. Products include Myo-Blitz, Ressurect-PM, Testogen-XR, and Pro-Antium.